Atabey Sánchez-Haiman is an artist with a simple, yet meaningful vision. “I make art that makes people smile,” she says. “My art’s purpose is to make people happy.” Bright and colorful – with a signature palette of yellow, orange, and red – her art is instantly recognizable as a Giraffes and Robots original. Originally from Puerto Rico, the Brown graduate has made a significant impact on the local art scene in the last few years, from showcasing her work at artisan fairs to opening her own gallery. The Giraffes and Robots Studio, located at Hope Artiste Village, is an immersive experience like no other. “I want people to feel like they are stepping into one of my paintings or illustrations.” The studio features her seemingly endless collection of fun and motivational art. From affordable unframed and framed prints to large-scale artwork, each piece is created to bring a pop of positivity to any space. In the great tradition of pop art, her work is designed to be approachable. And like notable pop artists, her work has become quite popular in Rhode Island and beyond. 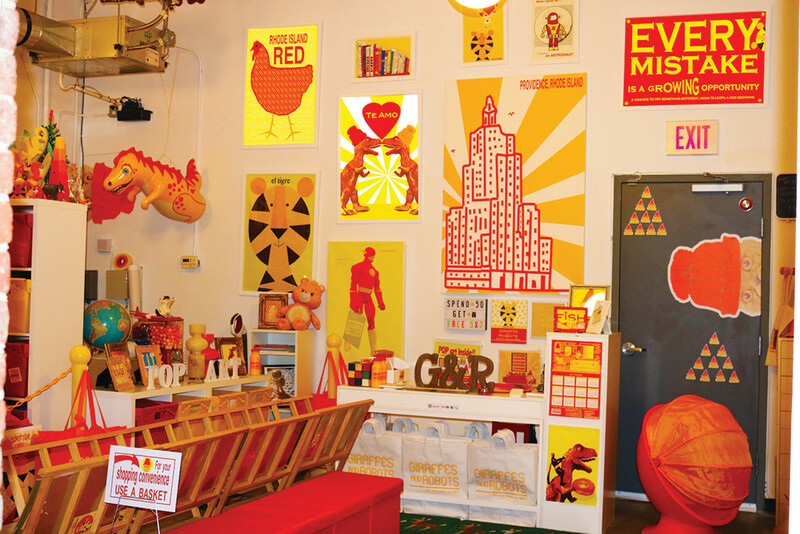 Her iconic Rhode Island Red and Superman Building series, to name just a few, offer an unexpected twist on the familiar. These popular works are also constantly evolving with new imagery and colors, making each edition unique. In addition to her own studio, her smile-inducing art can be found at local retailers like Stock Culinary Goods, Providence Picture Frame, and West Elm. Her one-of-a-kind commissioned art has also been in demand. “I’ve done custom pieces for boardrooms, schools, residential kitchens and living rooms, nurseries… even bathrooms!,” she says. Atabey collaborates with interior designers, homeowners, and businesses to create large–scale pieces that literally and figuratively brighten up any environment. With a mission to spread joy, Atabey’s simple yet powerful art continues to leave its uniquely positive mark everywhere it goes.